A Tablet computer seems to be on everyone’s gift list this Christmas and the choices are overwhelming. From generic, discount house Android tablets for $73 to fully loaded iPad with Retina display for $829. If someone in your life has asked for a tablet, what do you do? If they tell you exactly the type of Tablet they want, then you can just use the web and Google to shop. Click on the image at right and it will take you to a Google search for shopping for tablets. There’s no way we can compare them all, we can only tell you what we have and why. But first, let’s talk about Tablets in general. Tablets, Who Are They Good For? For people who have never fully embraced computers, tablets are the best way to gain entrance to the digital world. You don’t need an office, or even a desk. It doesn’t feel at all like work. You can hold them in your hand while sitting on the couch. You control them by touching the screen. No keyboard necessary, no mouse, no Alt or Ctrl commands to learn. You see something on the screen you want to do and you touch it. I know people who hated to use computers and have become hopelessly hooked on their iPads or other digital Tablets. I couldn’t even send these people emails before they got a tablet and now they’re posting to Facebook several times a day! I am amazed at the power of tablets to get previously computer-averse people involved. For people who do use computers, Tablets offer complete mobility. As travelers, we ditched the desktop many years ago and only travel with laptop computers. But even the smallest laptop is much more cumbersome than a tablet. A tablet can be used in a car, or a restaurant, or at a seminar. You don’t need a desk, or even a lap! They’re fabulous for showing pictures or videos. Take it with you to a party and have your entire trip’s slideshow ready to go, no wires or other equipment needed. I can take a tablet with me in my purse – a good reason for a big purse! 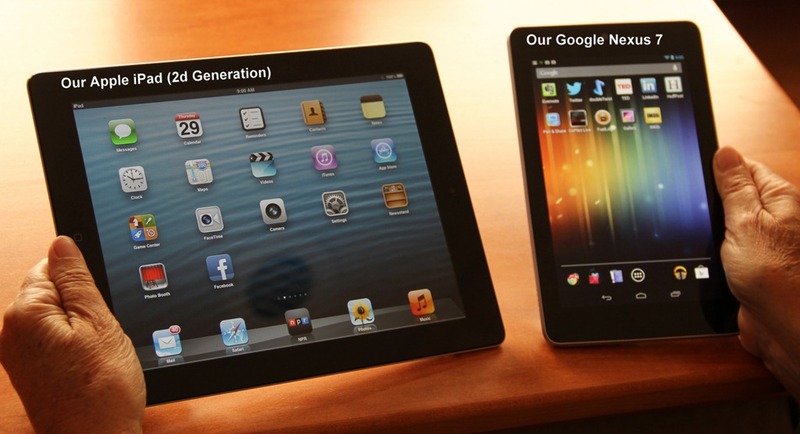 Tablets are good for consuming information – email, Facebook, web browsing, etc. If you need to create information like documents, spreadsheets, presentations, or even manage a library of pictures, you will find the Tablets insufficient. For people who use computers and smartphones, Tablets are basically smartphones with bigger screens. When you use a computer a lot and already have a smartphone, like we do, you have to think hard to come up with a reason to use a tablet. When we’re at home (in the RV) we have our computers right there. When we’re away from the RV, we have our smartphones with us at all times, so that is what we use to check email, browse the web, navigate around town, and post to Facebook. We have to really think about it to find a use for our Tablets. They have become special purpose computing devices for us. For example, occasionally we have a booth at a rally or trade show where we sell our memberships and DVDs and we need to be able to process credit cards. We have the little credit card swiping device that can plug into the headset port of our smartphones, but our smartphones are needed for other things. Here is where our iPad comes in. When we’re selling, the iPad is our dedicated cash register – because we don’t need it for anything else. We also use our iPad during seminars as a document camera – the iPad is connected to the projector, then anything we can focus its camera on can be seen on the big screen. We use this for demonstrating our smartphones. Our Nexus 7 stays beside the bed as kind of a clock-radio, weather station, media center. And we take it in the cab as a navigation device (using Co-Pilot) when we’re on the road. In other words, if you already have a smartphone and a computer, the Tablet becomes a special-purpose device, or it gathers dust. We got the iPad when the second one came out because, well … just because. We’re Geeks and we need to have the latest toys. We didn’t jump on the bandwagon with the first iPad, but when the second one came out and had cameras included, we couldn’t wait any longer. We bought the Wi-Fi only model because it was substantially cheaper than the model with cellular connection capability. I believe we paid about $650 at the time, and the Wi-Fi PLUS Cellular model was over $800. We have our own Wi-Fi hotspot (with our smartphones) wherever we go, so we figured we didn’t need the cellular model. We regretted that decision. We learned the hard way that the Wi-Fi only model does not have a GPS receiver built in. We had hoped to use the iPad for navigation – that’s not possible without a GPS receiver. We’re glad we have the iPad – it is still the benchmark against which all other tablets are measured. The missing GPS in our iPad is a big part of the reason we got a Google Nexus 7 tablet when it first came out. For $249 we got this 7inch tablet with the Android operating system (similar to our much-loved smartphones) and it did have GPS built in. It comes with Google Navigation which we also love from our smartphones, but that needs an Internet connection for its maps. We use Co-Pilot on the Nexus 7 for navigation in the RV. If we didn’t already have the Rand McNally RVND, we would use the Nexus with Co-Pilot all the time. Can a Tablet Replace your Laptop Computer? For us, the answer is clearly No. We need our computers for managing our websites. Although I can use our iPad or Nexus 7 to open the WordPress interface and make some minor changes, there are sometimes where something I need to click on just isn’t on the screen. Besides, I usually use Windows Live Writer software for creating the content for our websites (like this article) and it is not available on any tablet. All of my pictures are on my computer, and I use Picasa to manage and edit them. Picasa is not available on any Tablet computer. iPhoto on the iPad is pretty good, but I use Picasa and I don’t want to change. Besides, I have 80GB of pictures, the largest iPad is a total of 64GB. I also have at least 100GB of video files. My laptop’s 500GB drive is less than half full. Generally, if you use a computer to create content, or for any business related uses, you’ll find it very difficult if not impossible to do that on a tablet. If you only use your computer for email, web-browsing, music, videos, then a Tablet is all you need. It is the perfect device for consuming content – not so much for creating it. That said, if you just need to create the occasional document, spreadsheet, or presentation – you will find apps that make it possible. The Exception: The Windows 8 Tablets hold the promise of truly replacing your laptop because they can run legacy Windows software. With a Windows 8 Tablet, you should be able to run Picasa, or Quicken, or Streets and Trips. The current Microsoft Surface tablet is not Windows 8, it is running Windows RT which requires programming just for Windows RT. Dell has some Windows 8 Tablets available now, but we have not seen any of them ourselves. We’re waiting for the Microsoft surface running Windows 8 which is promised sometime after the first of the year. Probably the biggest factor is the operating system. That means Apple’s iOS, or Google’s Android, or Microsoft’s Windows 8/RT. If you are accustomed to the Apple world, you’ll be much happier with the Apple Tablet – the iPad from $4-800. The iPad mini gives you a bit of a price break ($329-659) from the full-sized tablet, and we hear it is just as good. We like the smaller, easier to hold, size. If price is really an issue, then you’ll probably stick with the Android operating system because there are so many manufacturers, that competition drives the price down. We don’t see how you can go wrong with the $199 Google Nexus 7 Tablet (16 GB) *. There is now a Nexus 10, but we haven’t see that. If you need to use Office productivity tools, like Word, Excel, and Powerpoint – you owe it to yourself to look at the Windows 8 Tablets, or even the Windows RT Surface 32 GB Tablet * since it comes with a built-in version of Office 2013. It does not have GPS. What about the Kindle Fire or Nook? I haven’t mentioned these yet because I see no need to get an Android-based tablet that is specially adapted and locked in to a retail store. The Kindle is locked into Amazon and the Nook is Barnes and Noble. If you want a Kindle book reader – there’s a Kindle App for any of the other tablets mentioned above to read Kindle books. That said, the Kindle Fire HD has a lot of fans and it does have some nifty, unique features, like touch any screen while a movie is playing and it will tell you who the actors are and what else they’ve been in. At $199, it also offers the best price for a tablet. Realize that you will get ‘special offers’ – meaning advertising. If you don’t want the advertising, the price will be $217. *all links above that take you to Amazon, include our affiliate number. If you buy after clicking on that link, we get a small commission, and you get our Thanks! As I mentioned above, we still primarily use our computers and smartphones. I know we don’t make the best use of our Tablets. Some of you probably do. Let us hear from you in the comments below. What Tablet do you have? How do you like it? What do you use it for? Published by MrsGeek, in Blog. Tagged with iPad, Nexus 7, Tablet. We looked at the Nexus, but could not see a way to load pictures except by using a computer. The Galaxy does have a micro SD card slot though. How have you loaded pictures into the Nexus? How else did want to load them? The Nexus 10 has a usb cable that connects directly to the computer and shows the Nexus like another drive. One can simply move files as you would from any other file to file. Then use a file management app to view and manipulate them. It also has Bluetooth and NFC which could be used. If all my music were already in PDFs I would have it on the Nexus by now. I’ve got 2 good fake books that were already in PDF, and they loaded with no problem..
I’m getting a Nexus 10, should pick it up today. You mentioned about dedicated uses, I have one. I will be putting all my music for my guitar on PDF files (some fake books already are) and using the tablet on my music stand. This will save much room in the motorhome, as the music is now in binders. The Nexus 10 became the choice because I wanted a big screen and good resolution. Yes, I already use a Smartphone and a computer (desktop, under my desk), and my wife has a laptop. I use a Verizon aircard in a Dlink router for connection when there is no wifi available. I would like a tablet which is basically a Smartphone without phone service. I’ve been with Verizon forever and am committed to it because my 8 kids, their spouses, and most of my siblings are on VZ so we get free incalling. But I tried a Smartphone for 2 weeks and didn’t like it as a phone (poor reception and sound quality.) Plus its VZ plan is expensive especially the new “share everything”. I love my LGNV3 with its flipout keyboard and 2 screens (and I’m grandfathered in on a unlimited text/pic and data plan– although data capability is diminishing as less sites support basic phones.) I’m aware that I will be carrying 2 things instead of one Smartphone–that’s why I want a small (Smartphone-sized, I wish) tablet. Most tablets seem to be wi-fi-only but I want it for travel and camping or driving around town so I don’t have to search out wi-fi service. Some say get a hotspot but then it’s carrying 3 things and expensive plan. VZ has a no-contract month-to-month plan for tablets ($20/1Gb,$30/2Gb)and good coverage, I think.Other carriers I haven’t researched. But which tablet can I get which is small and 3G or 4G, not wi-fi-only? So far, I only see the 7 inch (still kind of big) Samsung Galaxy Tab (not Tab 2, which is wi-fi-only) and it’s a much older tablet– I’d be buying refurbished and getting older technology. Is that ok? Is there a better choice? Should I wait for something new? What you’re describing sounds like an Apple iPod Touch. It’s a smartphone without the phone. I’ll bet you’ll love it. Although, I think you should give another smartphone a try – our Motorola Droid Razr’s are great for talking on the phone. Not all manufacturers are equal. I just googled Ipod Touch and it, like all the other new tablets I’m finding, is wi-fi-only. The whole comparison chart for all its generations never shows anything but wi-fi and usb to your computer. The Google Nexus is also wi-fi-only. ooops, I saw iPod Touch 4G and ‘assumed’ that meant cellular 4G service. I guess if you want cellular service on a smartphone-size device, then it’s a smartphone. You just don’t want to use it to make calls. The iPad mini comes in cellular-capable model.